Accord 12 x 6 Light Oak Return Air Grill Discounts Apply ! 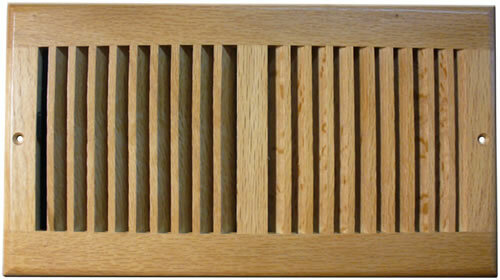 These wood return air grilles are stained in a light oak finish saving you time and money during installation. Use the sidewall vent cover to cover both heating and cooling ductwork. Our wood return air grilles are made from a North American red oak and will look great amongst your other wooden accents. These sidewall vent covers can also be mounted onto your ceiling with the provided screws. Purchase the wood return air grilles and have them shipped straight to your home. The sidewall vent covers feature a simple vertical, two way air deflection and do not come with a damper. ***Hint: When deciding what sidewall vent cover size to order, be sure to measure the duct opening in the wall. The 12 x 6 wood return air grille will fit a hole of that size. The outer sidewall vent cover faceplate will vary in measurements. Find unfinished wood return air grilles in a 12 x 6 size as well as a 10 x 6 size. Place an order today for sidewall vent covers today in this light oak stain today and install with no hassle!